Today’s appearance before Parliament was classic pro wrestling in spades. 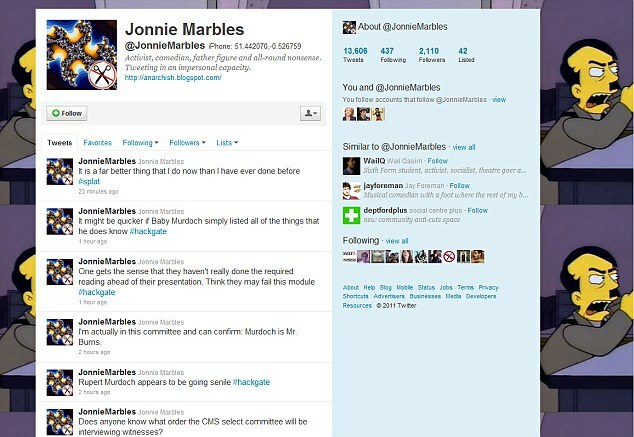 It seems that a dude called (Britspeak) Jonnie Marbles lost his and went all Soupy Sales on Rupe the Coot. The pie-thrower who attacked Rupert Murdoch is a renowned activist who is one of the founding members of a left-wing protest group. Comedian Jonnie Marbles – real name Jonathan May-Bowles – has been involved in protests in the past, it has been claimed. In a split second a reversal took place, perhaps. Rupert and Wendi switched and went face, using pro wrestling parlance. The heel-babyface transition may have been executed flawlessly. Wendi and Rupert’s gal lawyer Janet “Super” Nova went ninja and pummeled this bloke (Britspeak again) Marbles (his Twitter page infra) and the day was off to a glorious start. Had Marbles been in our country, he would have been Tasered repeatedly to the point of cardiac arrest, shot, bound, waterboarded and sent to an East European torture prison via rendition. LIONEL PODCAST: It’s Not A Police State. It’s A Military State. It’s Martial Law.